Oregon Governor Ted Kulongoski with the Mexican General Consul, Fernando Sanchez Ugarte. Thanks to Daniel for the picture. OPERATION ID: CALLING FOR ALL LETTERS! Get your OPERATION ID letter here. Portland’s Professional Protesters Come out in Force to Support Law Breaking Illegal Immigrants and to call for complete amnesty for illegal aliens already in Oregon. 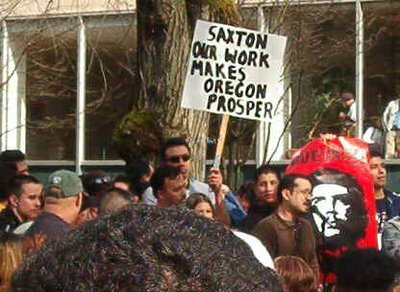 Oregonians for Immigration Reform responded protesting against Illegal immigration and in favor of LEGAL immigration. How is that racist again? Yeah, racists are what these good people were called because the only way the Portland Professional Protesters (PPP or P-3) win the day is by mischaracterizing the other side and going ad hominem. It’s a typical ruse. Decoy the media so they won’t connect the dots on just who’s advocating law breaking and bad policy. See the rundown on Daniel’s blog. Thanks for the picture, Daniel. Communist Che Guevarra was also there (see sign). Apparently Che is for illegal immigration. Just thought I’d connect those dots for you. Below are comments from emails I received on the protest while I was away at the Dorchester Convention. “No amnesty, no peace,” they chanted. “No justice, no peace.” That sounds like a threat. That makes them subversives. Did the police arrest any of them? A big hard news story unfolded yesterday in downtown Portland that WAS NOT REPORTED in this morning’s OREGONIAN But our only daily paper completely “overlooked” the story. I fought deadlines on three big city dailies and I am astounded.OFIR, Oregonians For Immigration Reform, DID hold a counter march and Jim Ludwick, Pres. and Rick Hickey, VP, bravely confronted some of the open border crowd.Rick was handing out your “Operation ID” letters for signatures. That is a wonderful program. My letter went in long ago. Thanks for ALL you have done. The AFL-CIO tool Prop 200 to court to stop the law from being enforced to the tune of $100 thousand dollars for one court case ( whcih they lost ) what do you think the union members think of that Rob ?? spending their hard earned money to slit their own throats?? hmmmm? ?